Easy recipe for moist dairy-free oatmeal banana muffins made with quick oats & whole wheat flour. They’re low fat and high fiber; perfect for a clean-eating breakfast! Who absolutely loves Banana Muffins? We all do! We’re all suckers for a nice, warm, buttery banana muffin but they’re not the healthiest breakfast option. They’re sweet as can be and very addicting so we can’t have them all the time. I mean, you could but eventually one day you’ll look down and you won’t be able to see your toes. You gotta be able to see your toes! I’ve come to realize that a lot of muffins are just breakfast cupcakes. That really is what they are. Now, let me be clear; I’m not going to stop eating them, but you gotta have some balance in your life. It’s time to cut back on the junk food breakfasts. Don’t deny it. Sometimes you have breakfast foods that aren’t really breakfast food because it’s easier to just throw some high corn syrup O’s cereal in a bowl with some milk and eat it. We all do this. I’m guilty of it too but we can’t go on like this. So for those of you who love banana muffins with all your heart but are trying to stay on track, I have a much healthier option for you! 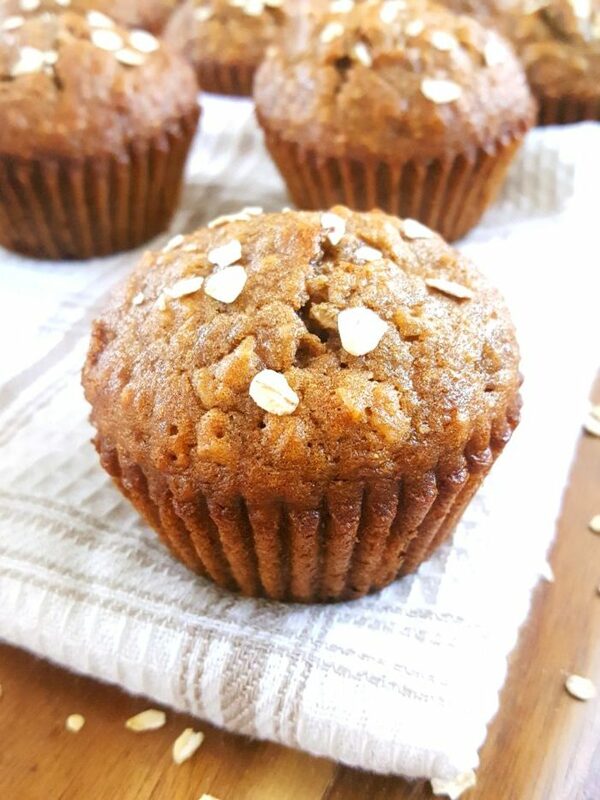 These banana oat muffins are made with whole wheat flour, they’re lightly sweetened, and dairy-free! But don’t think that just because they’re healthy means that they must taste like damp sawdust. Oh no, quite the contrary. They’re just as comforting as your good ole buttered up, overly-sweetened banana muffins. They taste good and they’re really good for you too. In other words, they’re delicious and nutritious! They make for a kid-friendly breakfast and they’re great for the lunchbox too. Toddlers just can’t resist. In addition to all that other great stuff this is such a simple muffin recipe. It’s really easy to make and it comes together in just ten minutes. 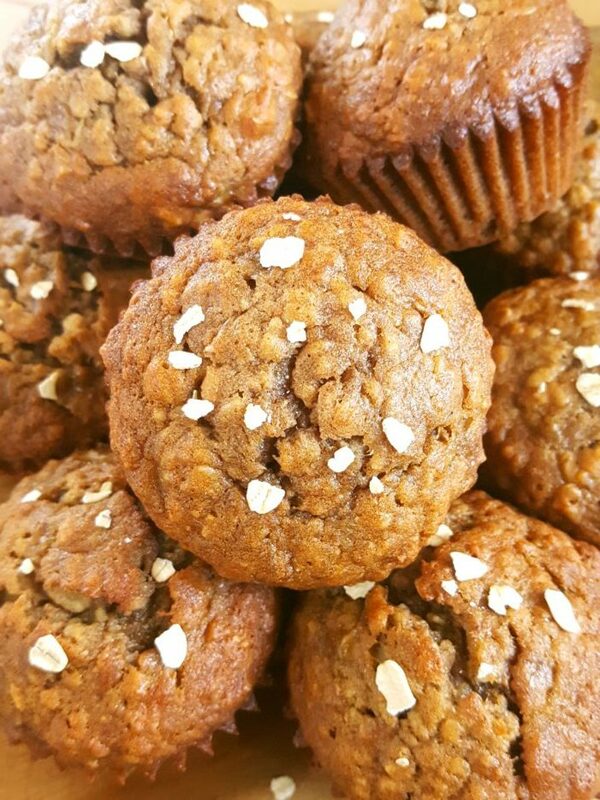 This is why I love healthy breakfast muffins (especially low fat oatmeal muffins) because they can be made ahead and you can take them on the go too! 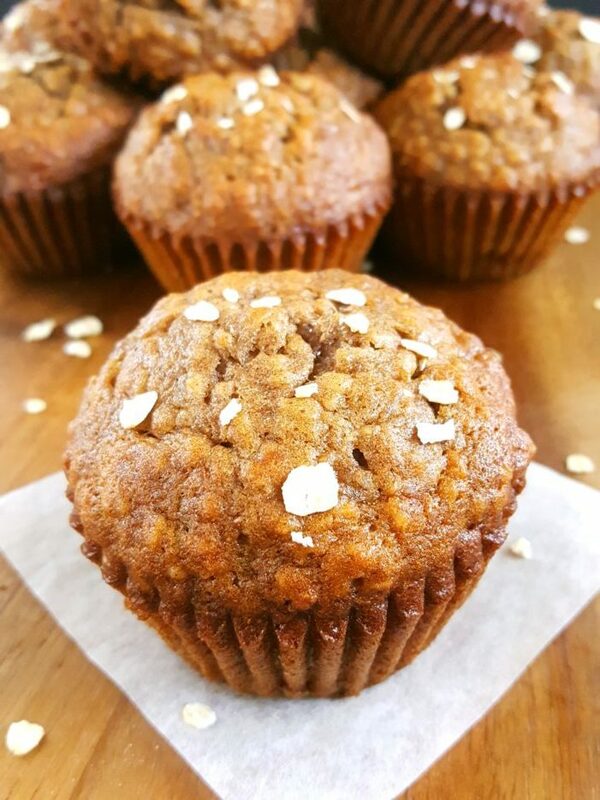 I used quick oats in this healthy oatmeal banana muffin recipe because I’m a quick oat kind of girl and they’re the best! Yes, better than rolled oats. I love how they’re really soft when baked and you don’t have to soak them before using them so it’s super convenient. Quick oat muffins are the bomb. I especially love that these healthy banana muffins don’t taste like they’re made with whole wheat flour at all! It was a very pleasant surprise. They’re so soft and moist and flavorful. Even the pickiest of eaters will approve of these whole wheat banana muffins. 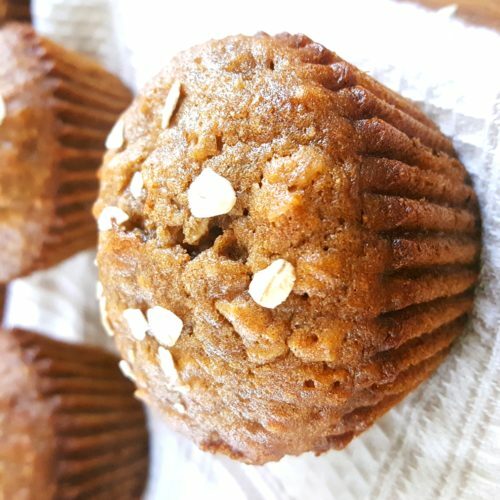 The 3 bananas in this healthy banana muffin recipe are for more than just adding banana flavor; they’re responsible for moisture and sweetness too so make sure that the ones you use are overripe! I tried to keep the sugar amount as low as possible but still enough so that the muffins are tasty and it worked out perfectly. You can use brown sugar or coconut sugar. 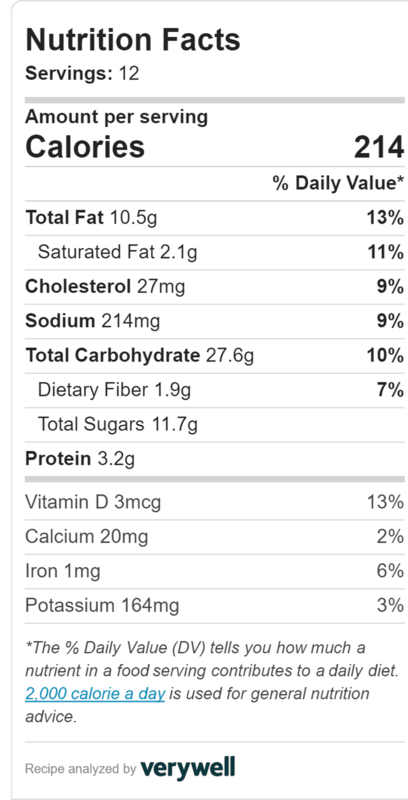 Both of these things help to make these banana muffins low fat. These muffins taste so good warm, fresh from the oven. I know this is true for almost all muffins but it’s especially true for these. If you give these banana oatmeal muffins a try leave a comment below and tell me what you think. I love hearing from you! Instead of having something with insane amounts of sugar and cholesterol for breakfast have these high fiber banana muffins instead! 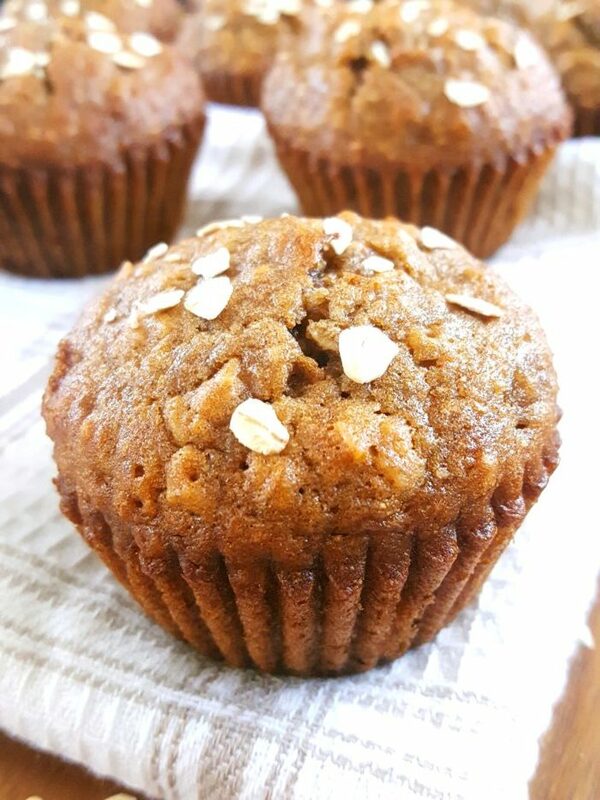 Easy recipe for moist dairy-free oatmeal banana muffins made with quick oats & whole wheat flour. They're low fat and high fiber; perfect for a clean-eating breakfast! Preheat oven to 375°F. Line muffin pan with muffin liners, grease with oil, or spray generously with nonstick cooking spray. In another large bowl whisk together the flour, oats, and baking soda. Add the dry ingredients to the wet ingredients and mix until fully incorporated (batter will be runny). Do not overmix. Scoop the batter into the muffin pan dividing it evenly between the cups and filling them to the top. Optional: Sprinkle the top of each muffin with a pinch of oats. Bake for 17 – 18 minutes until toothpick inserted comes out clean.